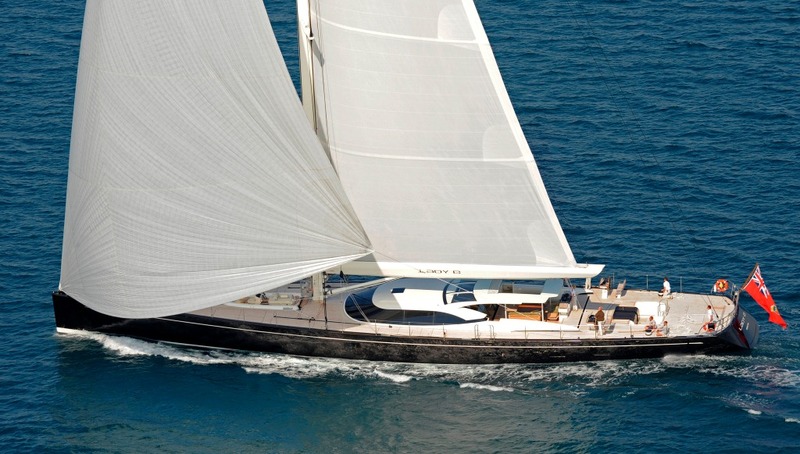 Luxury sailing yacht NINGALOO (ex LADY B) is a 44,7 meter (146,7 ft) superyacht with naval architecture by Dubois, built by Vitters Shipyard, combining exceptionally high-performance levels with superlative comfort. 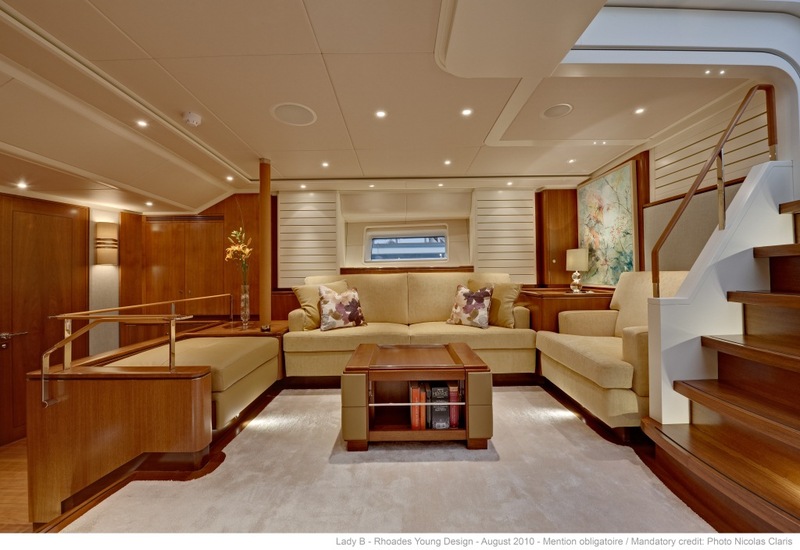 S/Y NINGALOO boasts a beautiful interior designed by Rhoades Young interior design with a clean and fresh ambience, with an emphasis on open space and light that generates a feeling of exceptional space below decks. 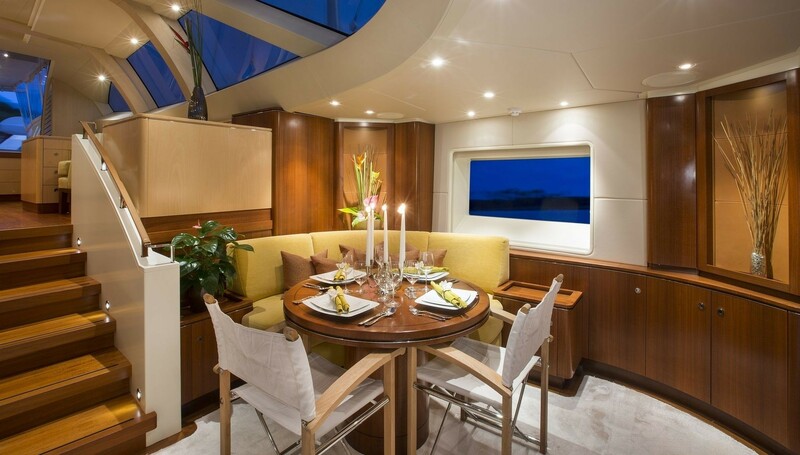 Beautiful interior elements include the glass panel doors connecting inside and outside, walnut woodwork, the extensive use of light fabrics with vibrant colours and artwork and stainless steel accents. 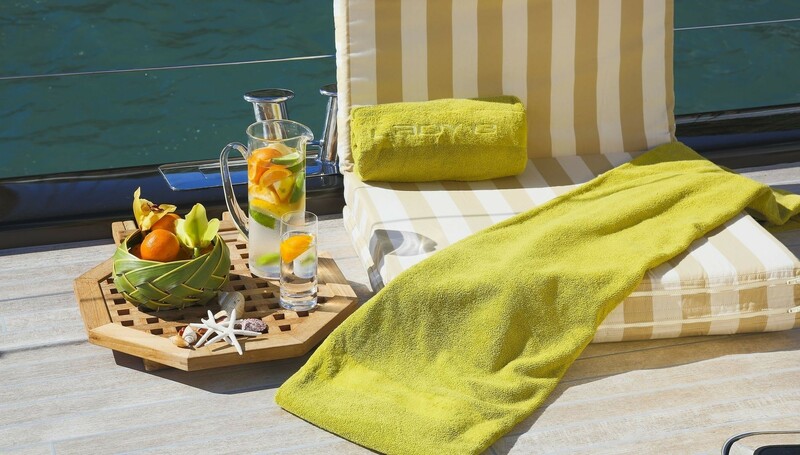 NINGALOO showcases many fine details such as unique handrails, buttons and fixtures, all of which add to the refined atmosphere onboard and become more apparent the longer time you are onboard. 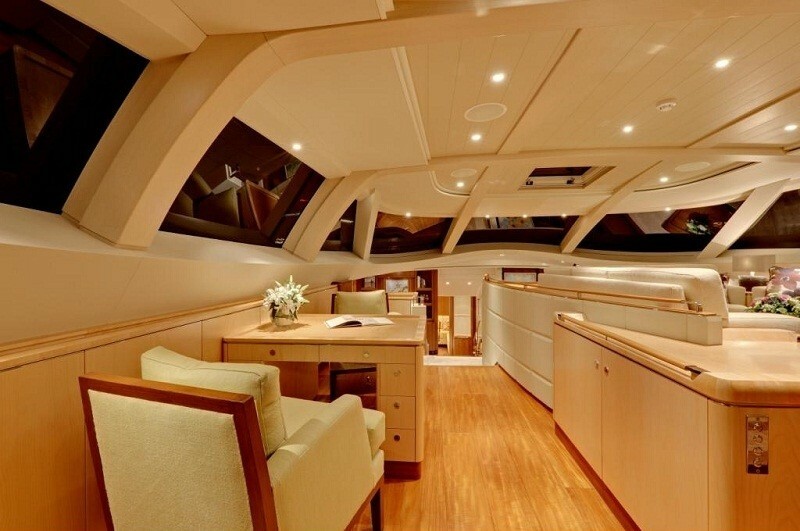 This feeling of space is most evident in the vast split-level upper and lower salons and dining area, where natural sunlight spills through the large windows sculpted into the upper salon sides. 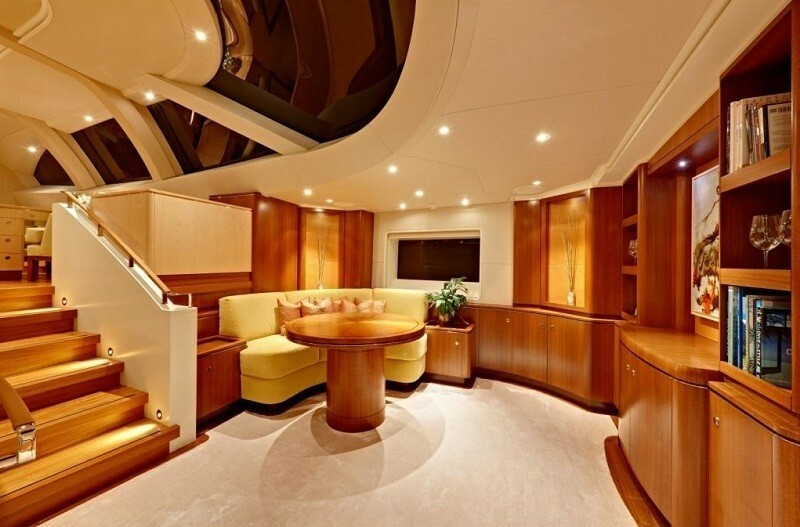 The upper lounge features 360-degree panoramic views with comfortable U shaped seating to starboard and a writing desk and stairs leading to the lower salon to port. 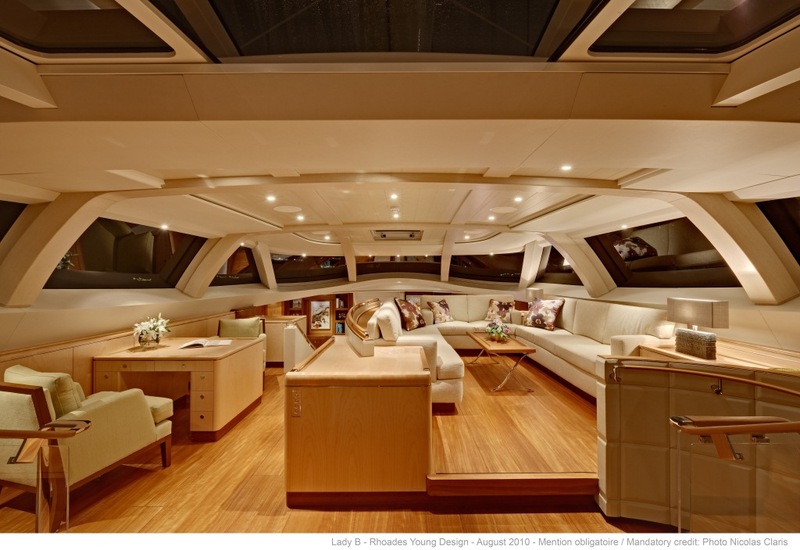 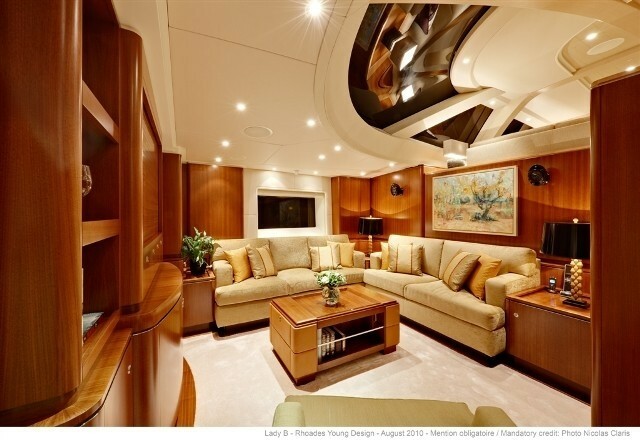 The Lower salon has more room with an entertainment system to starboard and an extendable dining table to port. 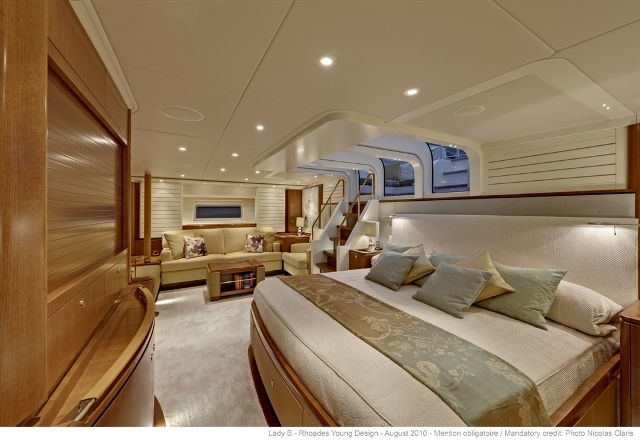 NINGALOO's master cabin is the full width of the beam and has its companionway aft to a private cockpit seating and dining area. 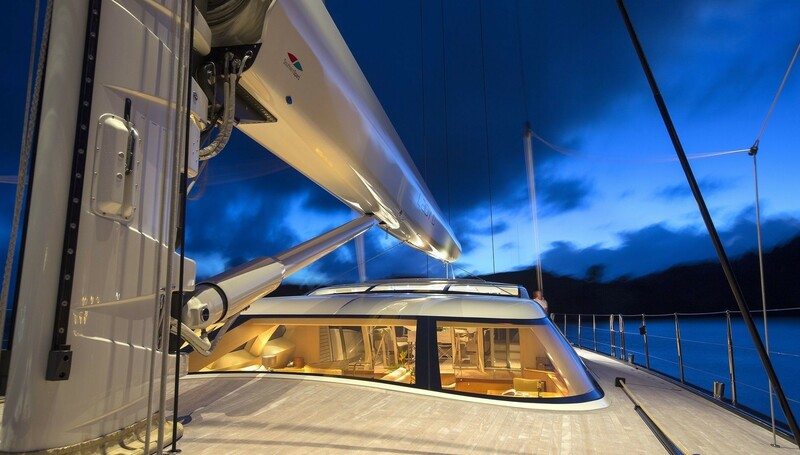 There is a vast panoramic skylight which floods the stateroom in light and gives a spectacular view of the curve of the mainsail all the way to the top of the mast. 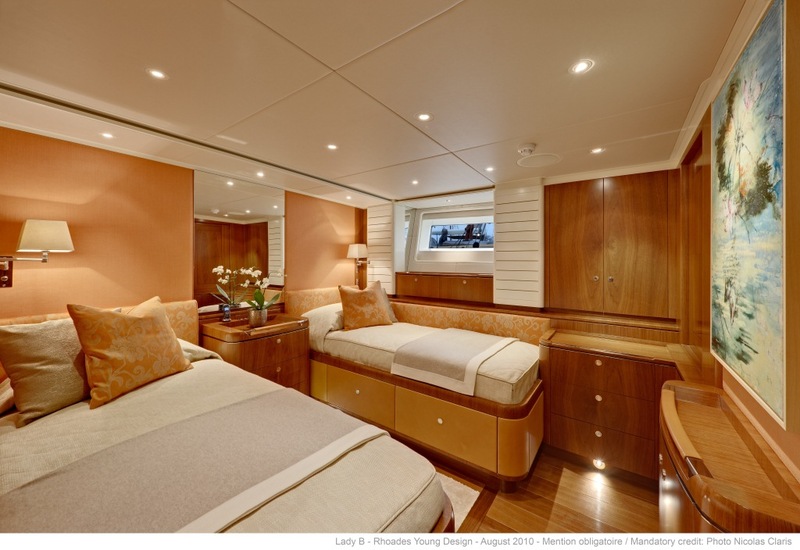 Two cabins can be made up with a double or twin beds, handy for any group configuration and a study that can convert to a single cabin if required. 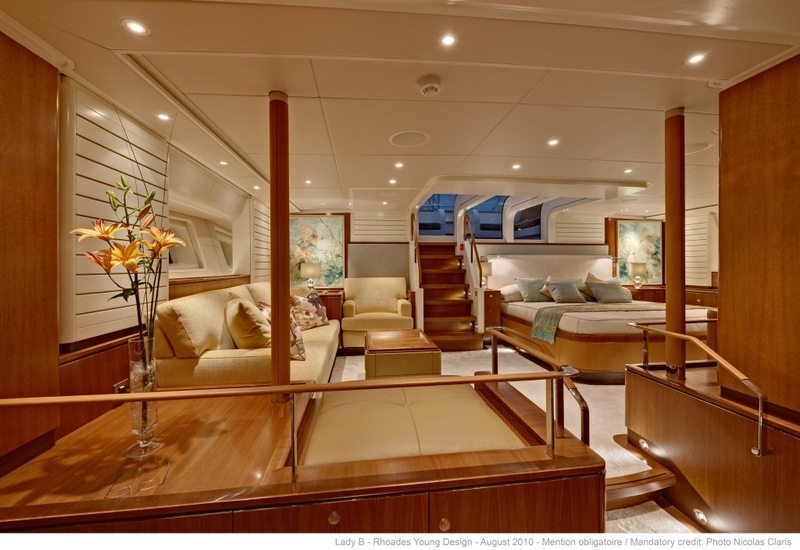 The exterior spaces of sail yacht NINGALOO are also elegant yet comfortable and welcoming. 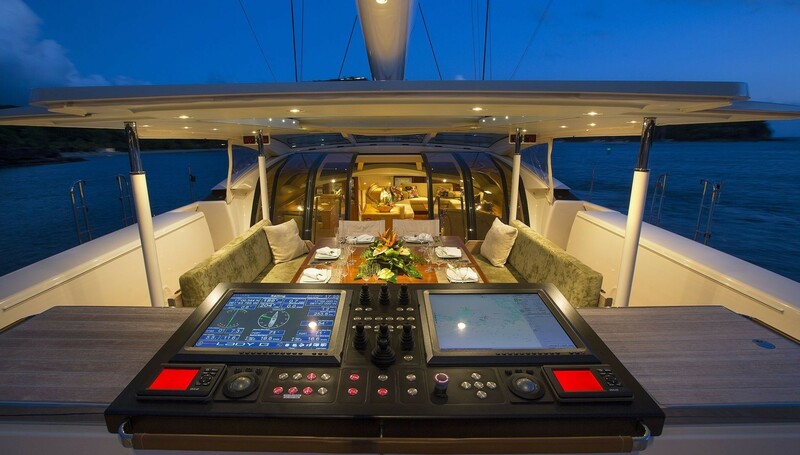 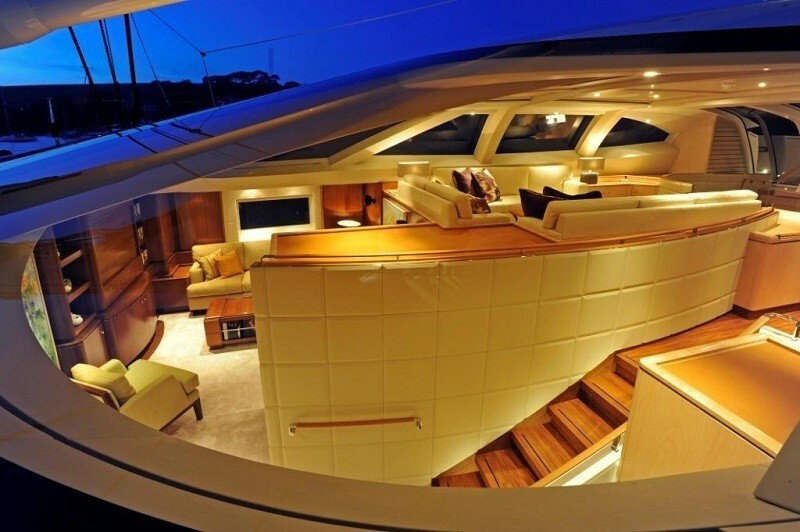 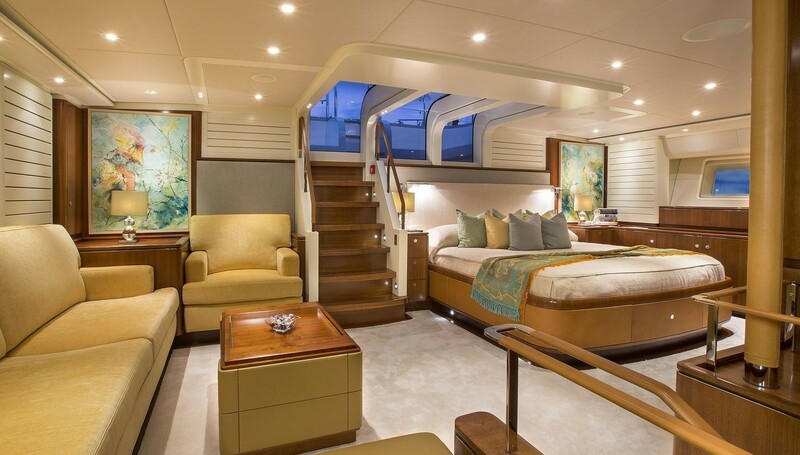 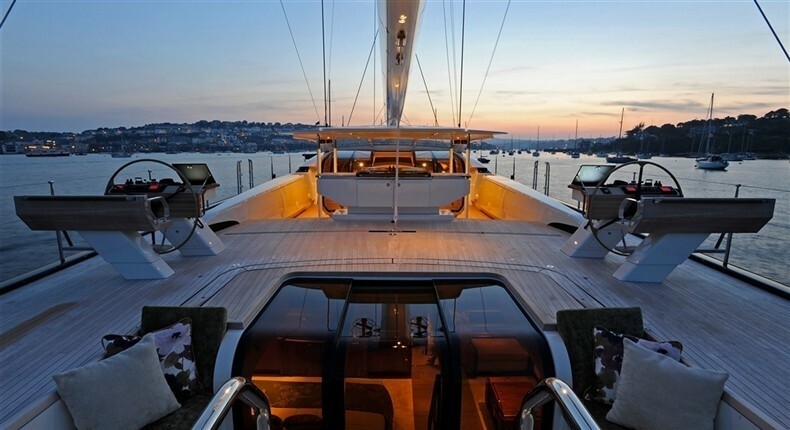 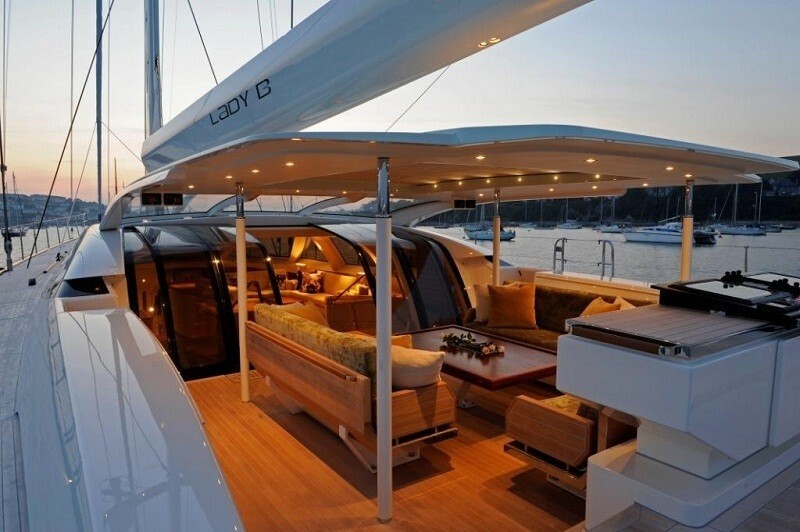 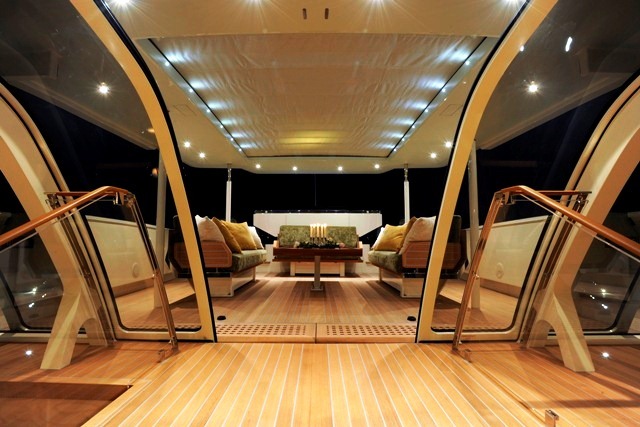 The custom-made sliding glass panel doors of the main companionway provide a seamless connection between cockpit and deck salon. 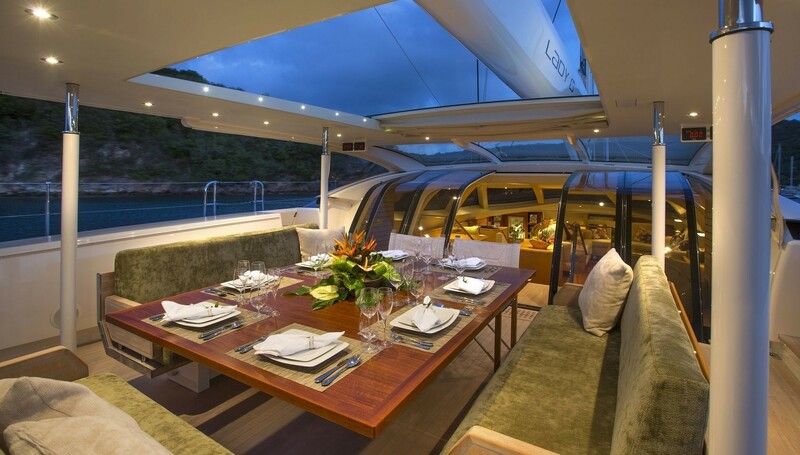 The cockpit offers seating on three sides surrounding a table which can be used for al fresco dining. 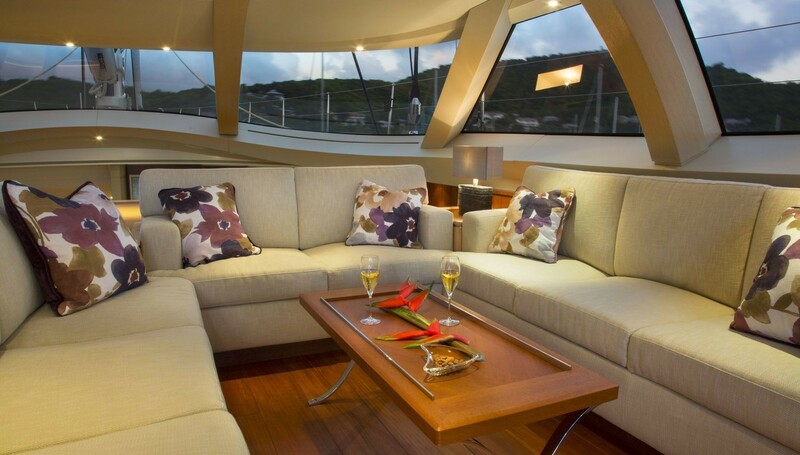 The bimini with the opening sun awning is carefully integrated into the design of the superstructure and can be closed off entirely to create a comfortable and sheltered area when sailing in colder climates. 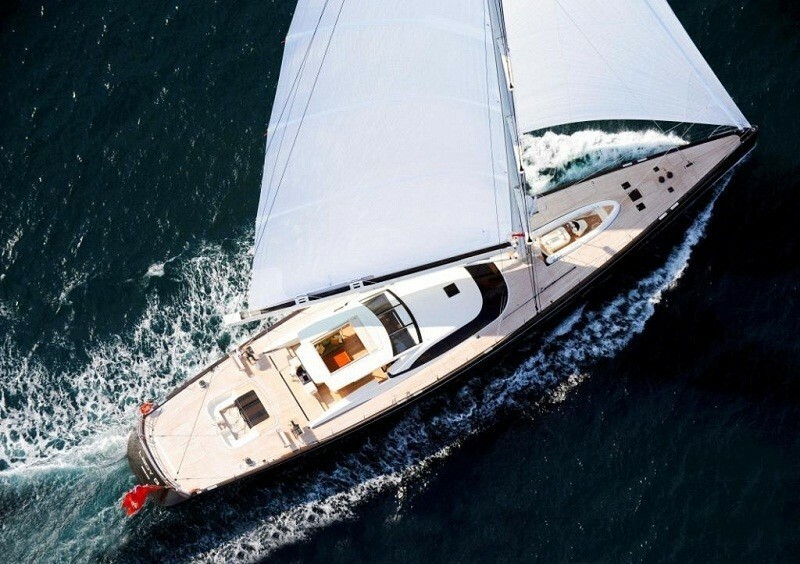 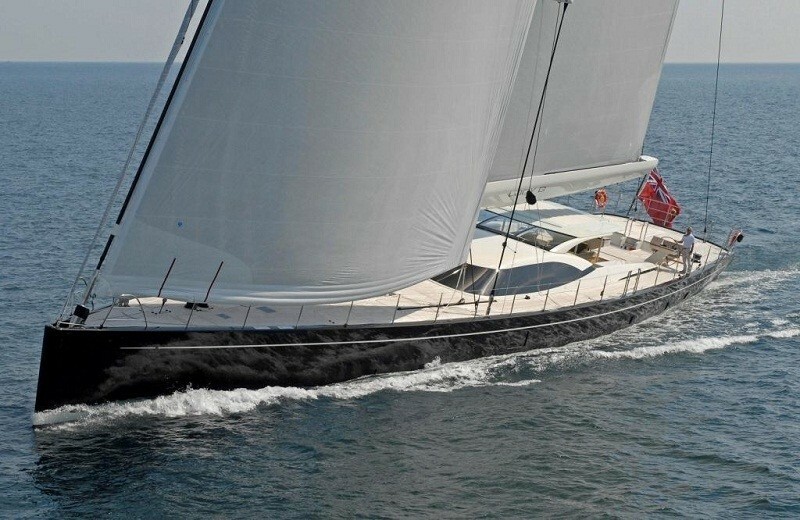 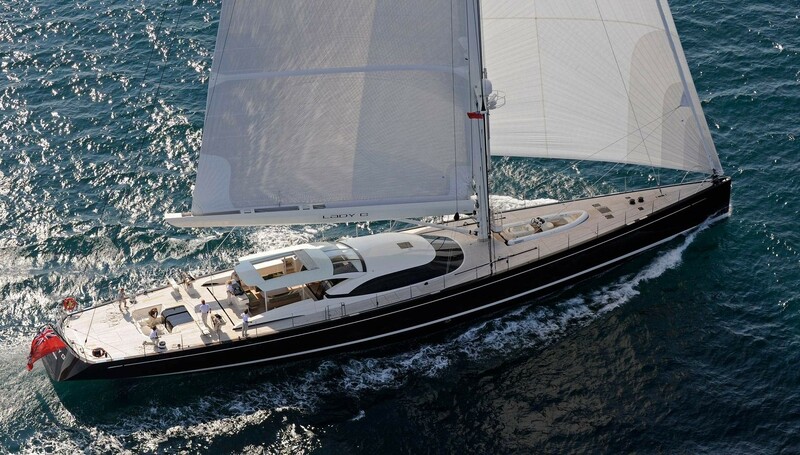 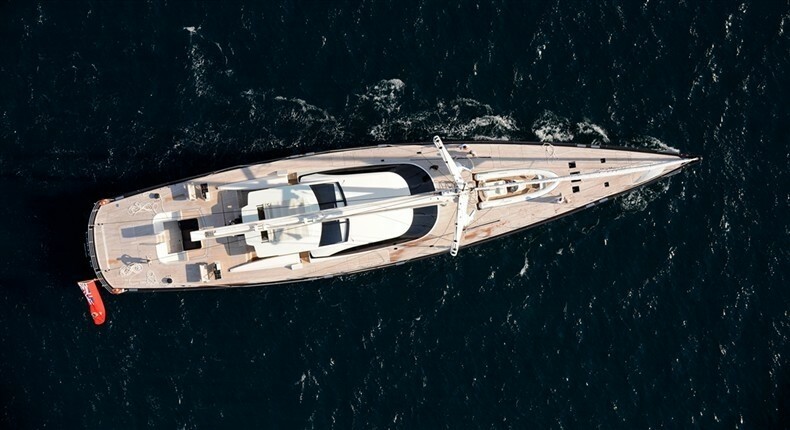 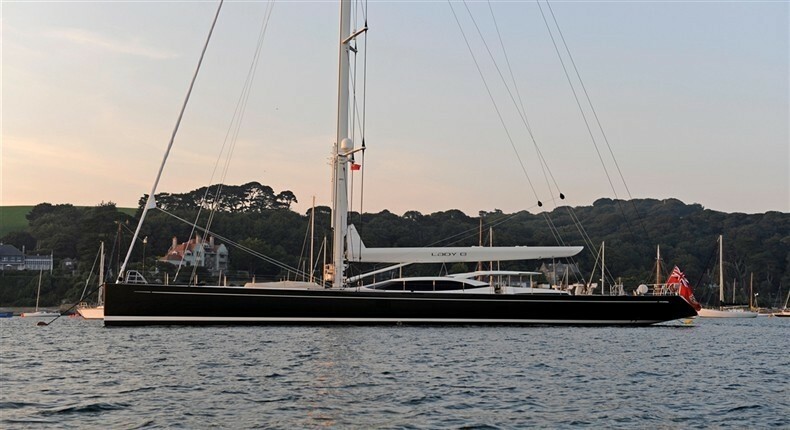 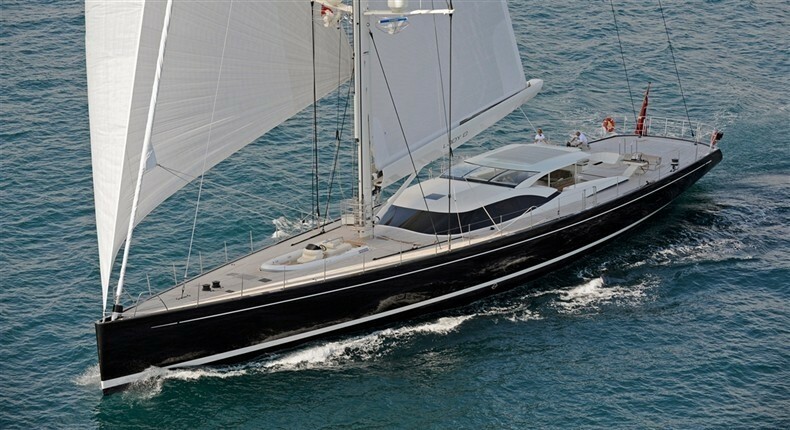 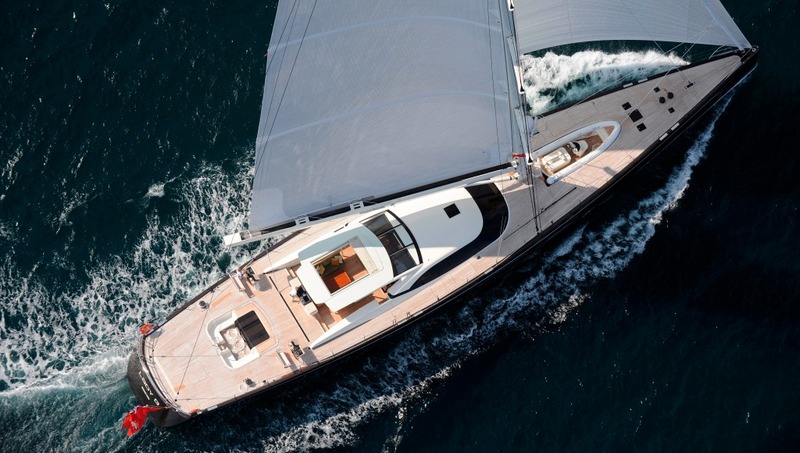 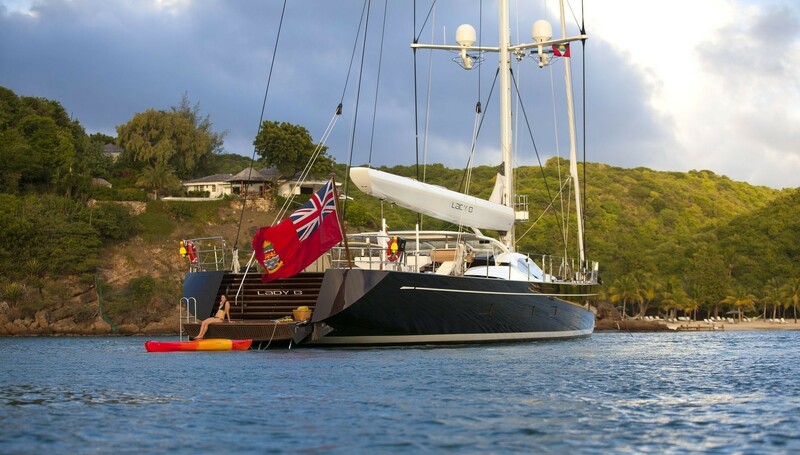 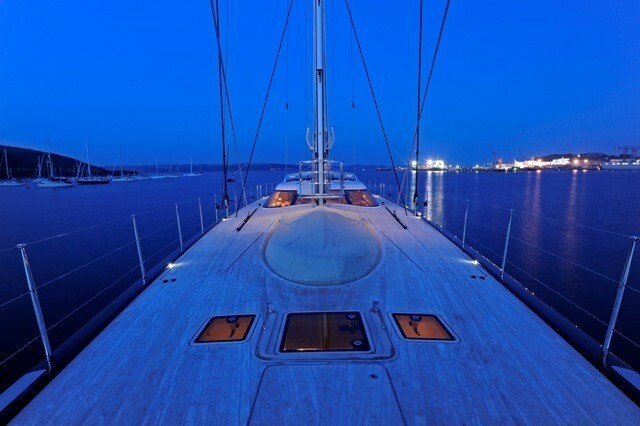 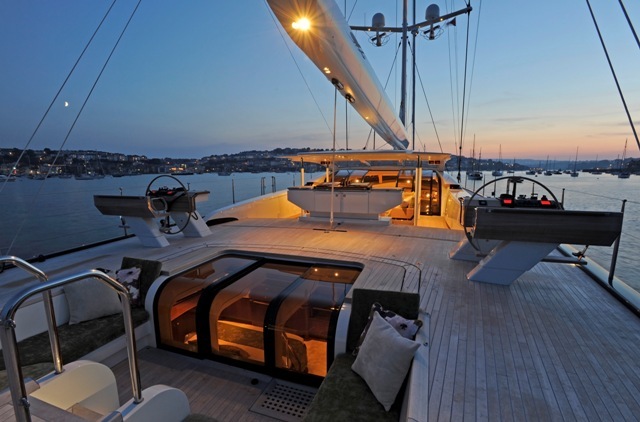 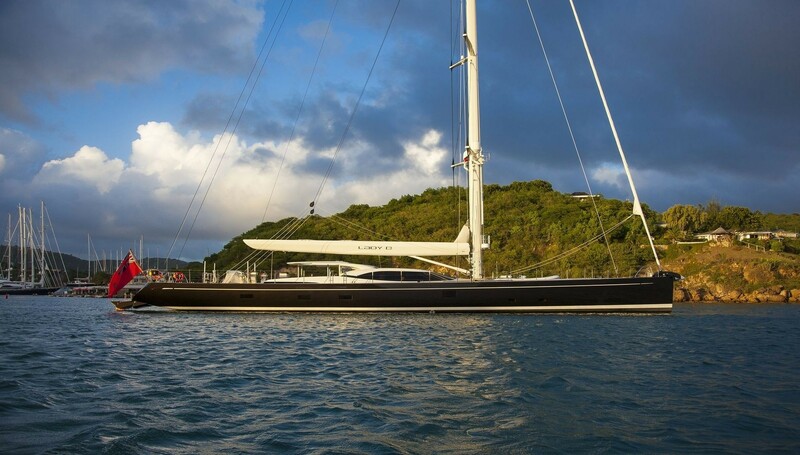 To provide fast speeds, state-of-the-art technology and cutting-edge styling, Dubois Naval Architects designed this 44.7-metre impressive sloop with an outstanding blend of architecture and ergonomics. 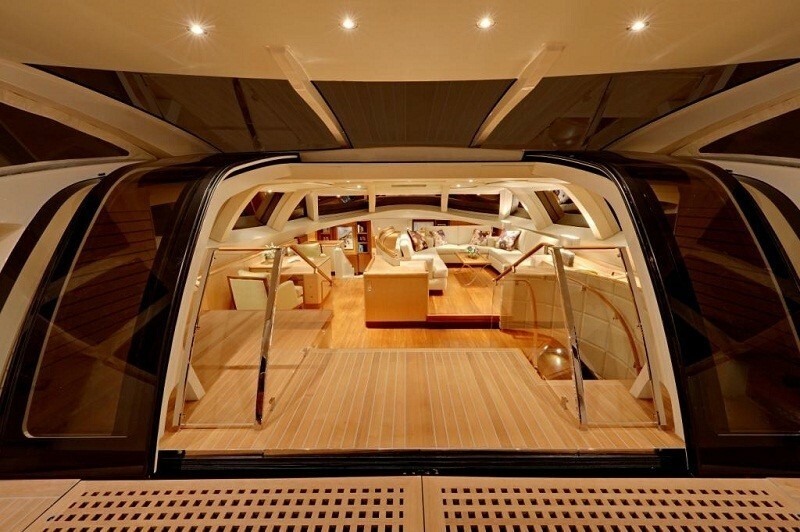 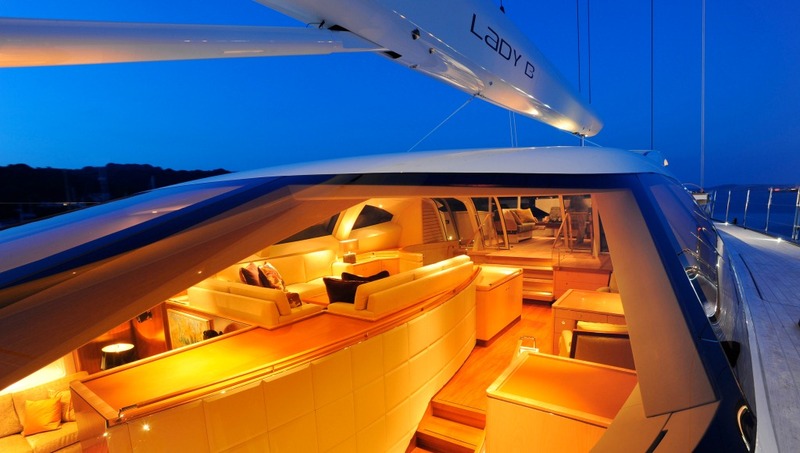 The vessel features a single-level superstructure, keeping the weight low and at the same time reducing windage. 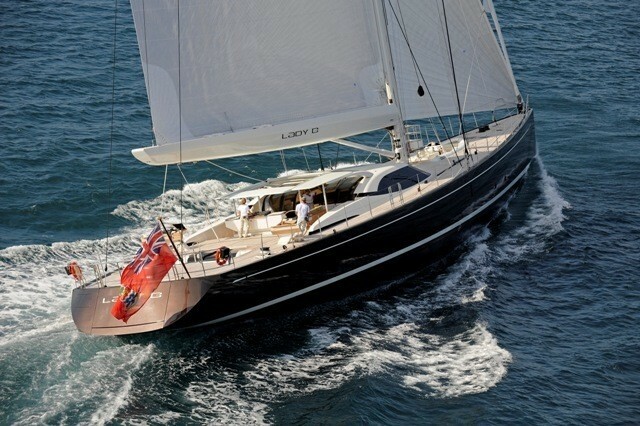 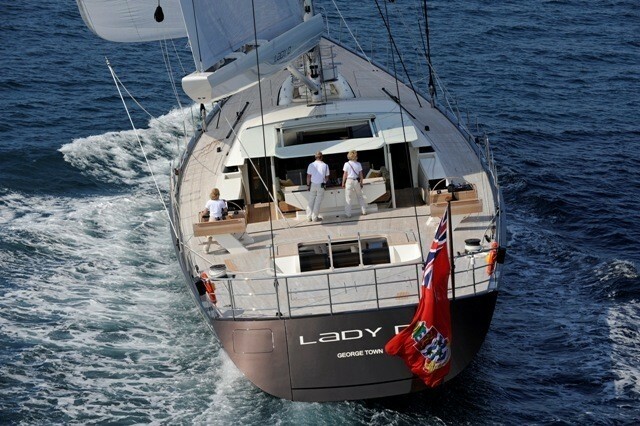 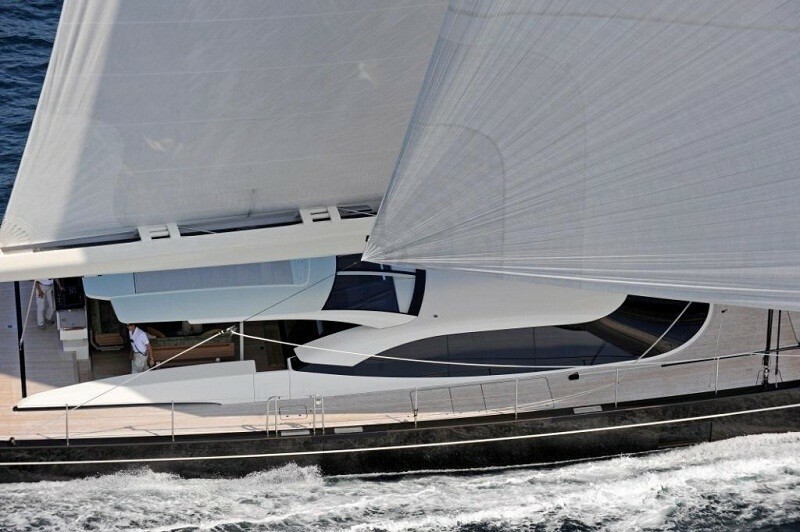 She is constructed in aluminium and has a high aspect ratio rig with carbon mast and furling boom. 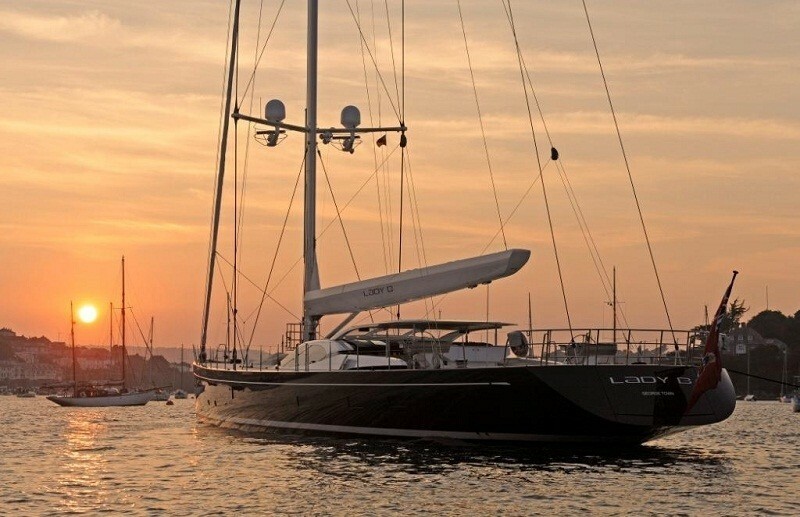 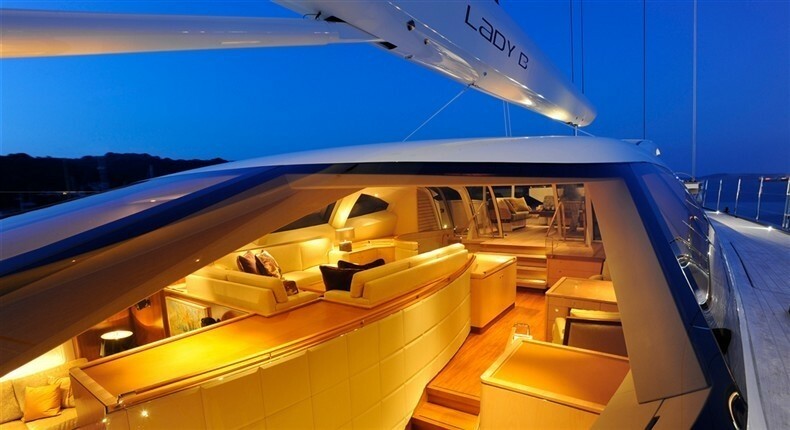 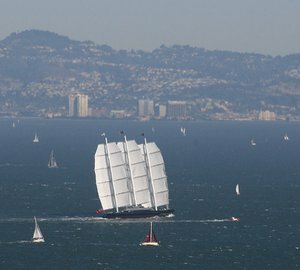 She is equipped with PBO standing rigging to enhance performance. 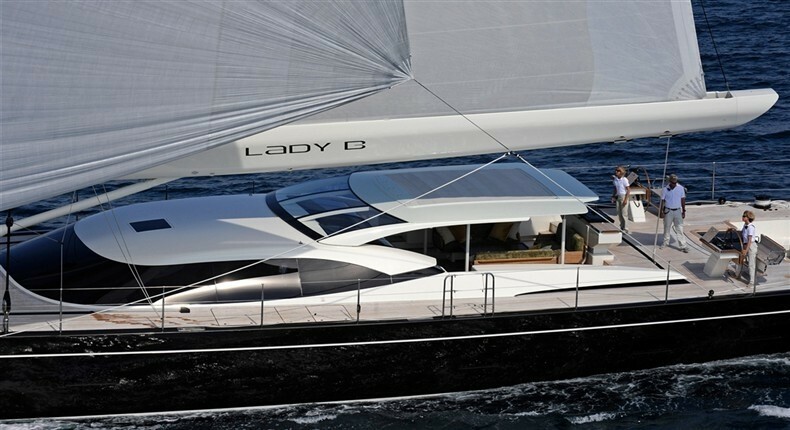 Her compact lifting keel system generates a variable draught from a minimum depth of four metres to a maximum depth of six. 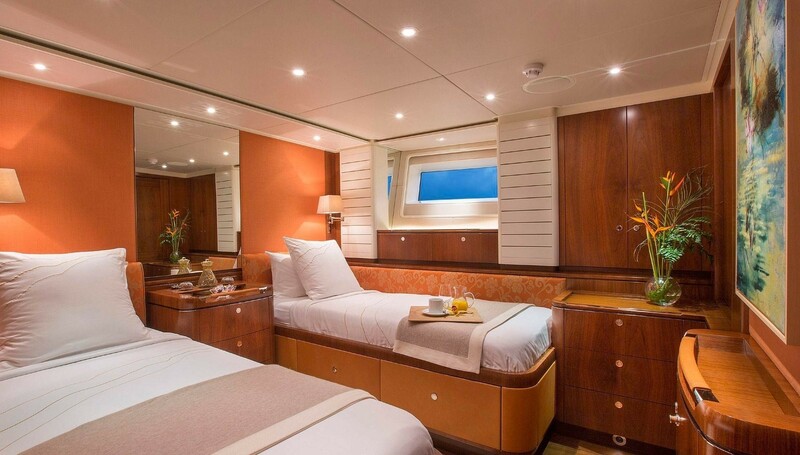 The full beam owner’s stateroom aft comprises a generous split level cabin with lounging area and a large bathroom. 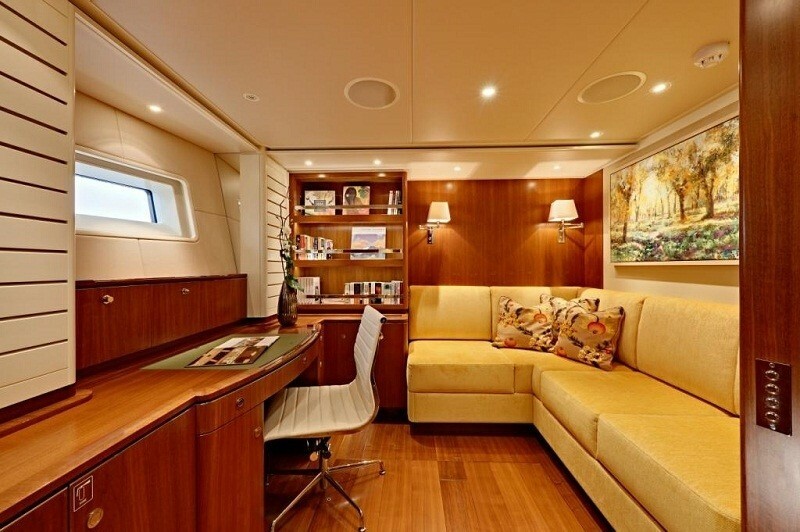 The adjacent owner’s study can be converted to a third guest cabin thanks to the use of sliding glass walls. 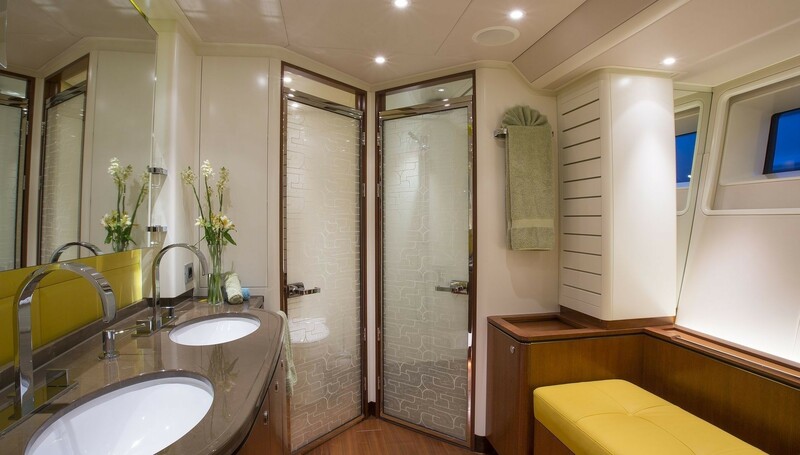 The two guest cabins can be converted from twin into doubles upon request. 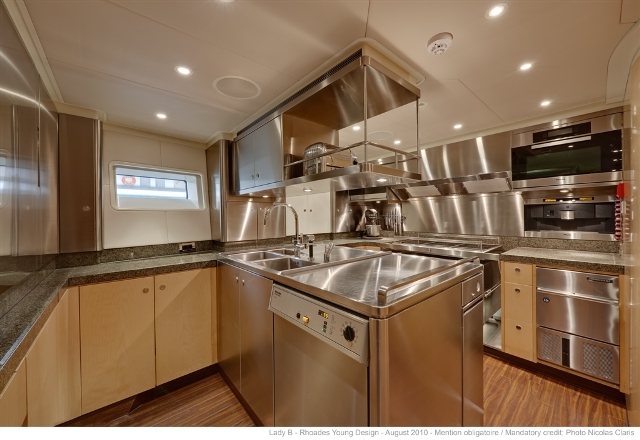 Further forward are located the generous crew quarters, featuring a galley for commercial specifications, a comfortable crew mess and up to six crew berths. 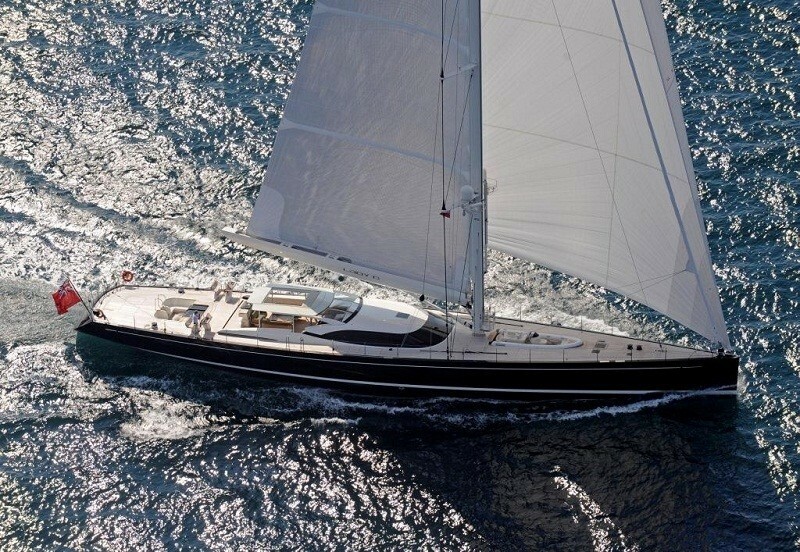 We do have available further amenity, owner and price information for the 44.7m (146'8") yacht NINGALOO, so please enquire for more information.